Birds…they symbolize an array of positive characteristics and for centuries have been a favorite subject in art, sculpture and home decor. This is especially true for country homes in the United States where folks choose to live close to the land and nature. 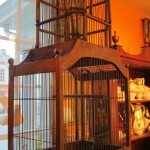 Bird cages (antique bird cages in particular), like the 19th century continental walnut cage pictured below, have long been a favorite decorative item because of their strong architectural and sculptural lines. 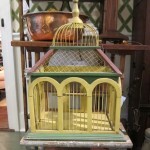 They easily add interest to any corner of a room. 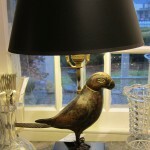 The Indian Bronze Parrot Lamp which is featured on the home page this week and below, is one of a pair found in our Terrace Room in the shop. 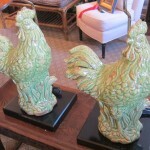 The magnificent size and color of the pair of rooster lamps found in our Parlor Room at the shop will add personality in any large living room, library, or parlor. 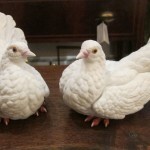 Brand new to the store this week and on display in our front Work Room is a beautiful pair of white doves reminding us each day to wish all of you, our special customers, a peaceful and joyful holiday season!